18 holes; 72 par; 5,973 yards; club rentals; cart rentals; lessons; restaurant and bar. Season: April through November. Bilou Roller Skating Rink Roller/Inline Skating Rink was founded in 1985, Bilou Roller Skating Rink of Fulton, NY is an indoor rink and open year round. Roller skating sessions for the public are one of the main attractions at Bilou Roller Skating Rink. Skating provides great exercise and an opportunity to get out of the house – plus, it’s not like exercising at the gym… skating is fun! Lace-em up and come join the others. Get on the floor and get ready for a great experience. 3/8-mile clay oval on US Rte. 11, features the best in DIRT Modified/358 Modified, IMCA Modified, Dwarf Cars and Four-cylinder Super Stocks. For race day weather updates and event information, call the speedway raceline at (315) 668-RACE (7223). The 18-hole “Caughdenoy Links” course at the Caughdenoy Links facility in Central Square, New York features 6,204 yards of golf from the longest tees for a par of 72. The course rating is 68.9 and it has a slope rating of 114 on Blue grass. Designed by George Swatt, the Caughdenoy Links golf course opened in 1995. Chris Lawson manages the course as the Owner/Manager. Located in Oswego, New York, Evergreen Hills is quickly emerging as a viable option for any golf enthusiast. Boasting affordable rates, a relaxed atmosphere, and the best customer base around, we are the most improved course in the area over the last decade. A 9-hole course that is great for golfers from ALL walks of life, we are located a few short miles from the campus of SUNY Oswego. Known for having the greenest greens and the coldest beer around, we welcome all golfers! The 18-hole “Glennwood” course at the Glennwood Golf Course & Driving Range facility in West Monroe, New York features 5,578 yards of golf from the longest tees for a par of 71. The course rating is 61.8 and it has a slope rating of 107 on Blue grass. Designed by Glenn Green, the Glennwood golf course opened in 1998. Mark Green manages the course as the General Manager. Jay Peck is a fly-fisherman and fly-maker in Spencerport, near Rochester, in Western New York. He is a New York State Registered Guide, specializing in Fly Fishing Catch and Release. He leads his guests on fly fishing expeditions in western and northern New York State. Call Jay at (585) 233-0436 to talk about setting up a great day of fishing almost any time of year! June – August every Sunday at 4 p.m.
To reserve the Community Park for a party, picnic or any special event, please call Rich to schedule usage to guarantee your spot. April-October. Featuring the NYATVA Series, CNYMRA races and the Gatekeeper Memorial Race. Admission charged. Quarter Midget racing track located on corner of Oswego Country Airport, at Silk and Howard Rds., off NYS Rte. 3. Races are held Sundays, April through October. Free admission. Call (315) 592-2555 or 598-5458. Free club rentals. Lessons may be arranged. Season: April through October. Quilt With Passion began as a business in 2016 while after teaching quilt classes and holding retreats for many years. It was developed while pursuing a Certified Instructor Certificate through Judy Niemeyer and Quiltworx. After retiring as an educator and elementary principal, Julie Burger decided to combine her enthusiasm for both teaching and quilting and Quilt With Passion was born. She teaches quilt classes at local quilt shops, holds workshops, trunk shows and retreats for groups and guilds. Julie takes pride in having fun and “SEWial” sewing while learning in her classes and hopes that every class feels like special event. View majestic falls from trail or parking lot. Upstate NY has seen its share of battles and countless stories have been told of the men and women who have fought for the freedoms that we celebrate but a number of those stories stand out as being particularly interesting. One such story is the Battle of Oriskany in the Revolutionary War which helped set the stage for an Upstate NY-er to not only help win the battle, but go on to be the sole burial in a park named for his bravery. 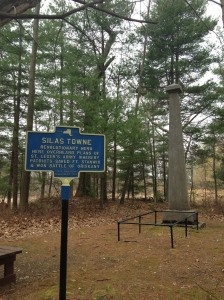 Silas Towne first overheard of British Brigadier General Barry St. Leger’s plans to attack Fort Stanwix and made his way ahead of the British troops to warn General Nicholas Herkimer of the coming movement. Though the battle is known to be one of the bloodiest of the Revolutionary War fought on North American territory, Towne’s intelligence gathering proved more than useful to the Patriot forces in defending their position. After becoming a worthy ally to the Patriots, he went on to lead a successful career as a spy up and down the St. Lawrence River. Upon his retirement, he returned home to Mexico and later, requested that when he passed on, that he be buried on Spy Island, the place where his career as a military intelligence gatherer first began. Near the entrance to Mexico Point Park lies a short, easy wooded walk along a marshy area and doglegs toward the nearby Lake Ontario. 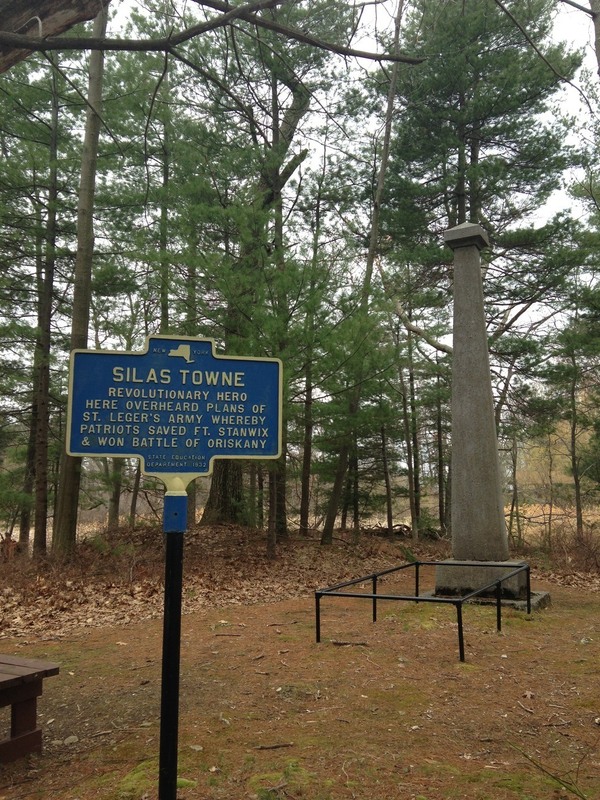 Just five minutes on the path and you’ve arrived at the final resting place of Silas Towne, the namesake for “Spy Island”. Not far from Pulaski, The Pines Golf Course offers terrific views and challenging play for golfers at every skill level. Well-groomed fairways and greens keep The Pines Golf Course difficult yet friendly, and the staff can offer tips and tricks for playing your best round. The Pines Golf Course is a terrific choice for your regular rounds of golf or a new destination for you and friends when visiting Pulaski. Featuring Outlaw Motocross racing and Quad racing (4-wheelers). Scheduled evens plus practice track Thursdays. Contact for more information. Family amusement park features eight water slides, large zip line, 18-hole miniature golf course, go-karts and games. Oasis banquet facility offers year-round catering. Mini-golf and NEW water wars game open to the public. Shoot water balloons at your opponents using water balloon launchers. Are you a Walking Dead fan, or just like Zombies in general? We have just the thing for you! Try our Zombie Paint Ball where you can stop the Zombies from taking over the orchard. Demon Acres sits on 25 rural acres in Hannibal, NY. We currently feature four Haunted Attractions, DEMON’S DEN, DEPTHS OF THE DARK FOREST , INSANE ASYLUM and JAIL BREAK. These attractions feature High Tech Special Effects and Hollywood Quality Sets to provide you with the scariest time possible. Join us to celebrate the Halloween Season with some of the most terrifying sights in New York State. We are open every Friday and Saturday in October from 7 – 11 pm. Parking is FREE! Tickets may be purchased online by clicking here, or on-site, cash only at all ticket windows. Three award-winning attractions designed to safely transport guests to a magical world of fear. Professor Whitaker searched the globe for supernatural antiquities in the Museum of Fright Haunted House. Enter the Professor’s Twisted Labyrinth to discover hidden creatures and treasures from around the world. Admission is $16-$27. Purchase tickets ONLINE. Fridays & Saturdays, 7-10 pm October 5-27, 2018. The forest is quiet during the day, but at night the monsters come out to play. Bring some friends and ride if you dare! It’s fun, but be prepared for scares. We offer family friendly wagon rides Saturdays & Sundays during October from noon till 5 pm. Our “forest” is decorated and fun to see. We have a snack kitchen, animals to visit, a maze to go through, products for sale such as Pumpkins, Cider, Apples, Cornstalks, Baked goods, Honey and much more. Hayrides $1.50 per person. Ages 2 and under are free. Our original and longest attraction is the Haunted Forest trail ride. Discover the spirits that lurk in the night in our custom passenger wagons or for the even more adventurous, our Hearse! This is an authentic antique hearse and it has been used to transport many a mortal to their final resting place. Wind through the forest as you uncover the evil that lurks in the night. Every twist and turn uncovers new sights and sounds for all to enjoy. For our braver guests we also offer our walking trail. A totally different experience from our riding trail that lets you get up close and personal with your fears. Not everyone is up to the task but If you have nerves of steel, you just may survive it. If close quarters aren’t your thing, we strongly suggest you stay away from our cabin in the woods. The Family there has their very own special brand of southern hospitality. Thought we’re sure they’d love to invite you in as their guest, we aren’t so sure they’ll want you to leave. The Forest is open Fridays and Saturdays for the Month of October. Night time attractions are open from 7-11 pm on Fridays and Saturdays. Greetings Hallowed Fans, we will be open starting Friday September 29th and will be open every weekend until Saturday October 28th. Be ready for the new surprises we have prepared just for you! Brave the Haunted Hayride’s winding path through the cursed woods and see what awaits you in the blackout. Dare travel through the twists and turns of the Haunted House. Who knows what is lurking around the unseen turns of its 2000 square feet of hell. Kids beware, Pennywise has been seen wandering the property as of late! Beware the Hearse Ride and its open casket seats as we take you out into the woods for a ride you’ll never forget. Well that is if you even come back! State Route 104 in the town of Williamstown approximately eight miles east of exit 34, off Interstate Route 81. Open dawn to dusk. A variety of menus, attentive staff, wide open spaces, antique bar, Hardwood floors, private facility makes this the best place for weddings, conferences, workshops, Christmas parties, anniversaries, birthday parties, class reunions, bar mitzvahs and more. We’ve done all kinds of parties and events. We also have an outdoor pavilion for your fair weather events. Miniature golf, super go-karts, refreshments. Track or course rentals are available, as well as birthday and party packages. Open weekends, May and September, and daily, June to August.